When I saw the signage going up on Kearny Villa Road, I was excited. I was never thrilled to travel to Santee for a cherry limeade on hot days. And there was a time (very long ago) when I went to the Orange County location twice in one day just to eat. Now it’s basically in my own backyard. But it has some problems that need working on. Namely the indoor signage. What’s with the multiple television screens with 10 point type? I’m not a young chicken any more but I struggle just to read it. Secondly, the menu handout by the cash register doesn’t help. It has no prices and lists things not on the screen menu that making me cross reference between tv screens with the handout. It’s maddening. And I’m sure it’s not me. I see other people struggling with the confusing menu. 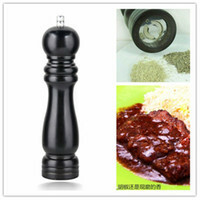 Last but not least, I think it would help to see a ring up of all the things I entered as well as final price. I’m used to that kind of stuff and like to see how everything adds up to $13 when all I ordered was a cherry limeade with large tater tots. Other than that, it’s a pretty nice location with modern roll up garage doors and I love the super friendly staff the refill my drinks. 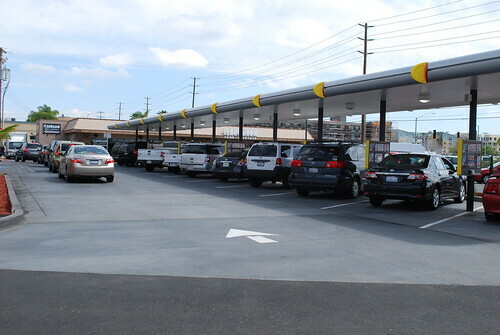 But I’ll never park in the carports especially when it’s busy since the drive-thru lane blocks cars from leaving.Too bad I never like the hamburgers – or even the new pretzel dog – but it sure beats going to Santee for some delicious tots. I still have never been to Sonic. We’re never near enough to one for a snack, and it’s not really somewhere I think I want to eat an actual meal. But I hear their drinks, shakes, and tots are worthy. Wow… Kudos to you. The tots are basically like the tots you get out of bag. Those are two great redeeming qualities of Santee. I think even the Costco gas is cheaper there too. But in the summer… man, it’s hot. I haven’t been to Sonic in a long time – probably since I visited Kansas about 10 years ago. Since you give a nod to the tater tots, I’ll have to try those sometime. I do remember liking their drink variety but don’t remember much about the food. Yeah, the drinks are amazing. Paul gets this peanut butter shake but requests a some grape flavoring and it tastes exactly like PB&J in shake form. Unfortunately, the drink goes from brown to gray with the flavoring additive. we had sonics everywhere when i used to live in texas. this one is set up a bit weird to me because i remember there being carports around the whole building on both sides but that might be the way my local hometown one was. i haven’t gone to any since i moved to cali almost a decade ago. anyway, we went here two days ago around 7pm and had no issues with drive-through blocking us. 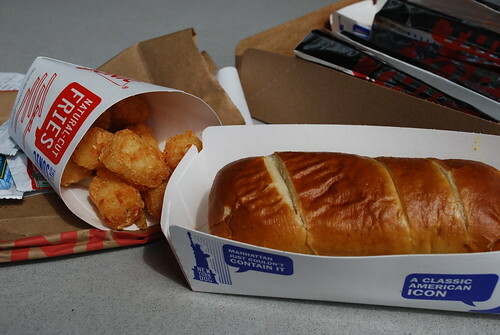 i like their chicago dog but haven’t tried the pretzel version. Isn’t Texas home to Sonic? 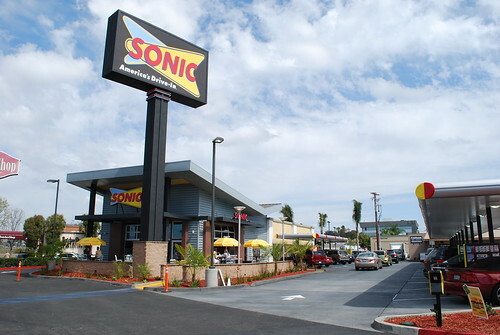 I think I recall a seeing a Sonic in Nevada as you described it. 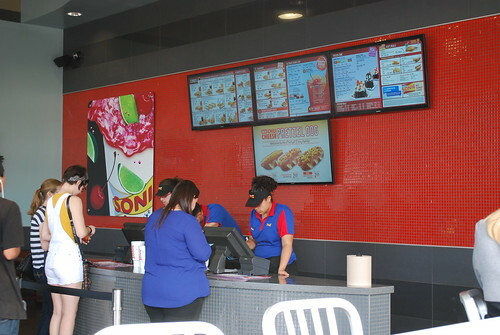 It also seems like the hype around the Sonic in Kearny Mesa died down quicker than the other places. We go “all the way” up to Annapolis for our Sonic fix (and shopping mall and Trader Joe’s). My kids and I like the kid’s meals; so we get a variety of chicken strips, cheeseburger, corn dog or grilled cheese, and everyone gets tots! It’s kid-friendly food and I don’t feel guilty having a burger. Hubby likes the hot dogs with toppings…It’s a treat for us like every few months.